More than 30 years ago a task force was commissioned by the Commonwealth to tackle a national disaster among Aborigines, which, particularly in remote areas such as the Northern Territory, was robbing young Aborigines of their childhoods and scarring them for life. It was no mean expedition. Before it was over it had visited more than 600 Aboriginal communities and country towns in all parts of rural Australia, and seen over 110,000 people, including 60,000 Aborigines, at least once. Each had a substantial medical examination. From the results of the initial examination, about a fifth were given a more intensive specialist examination by some of Australia's most skilled doctors. Nearly 2000 people received surgical operations, a good number in special army hospitals in the middle of the Australian desert, and another 6000 mostly older people were given glasses. Around 30,000 people in the Northern Territory, South Australia and Western Australia were involved in the month-long mass-treatment programs. There had been no expedition on this scale before, and there has been none since. The model of its organisation, and its practical findings, were widely admired, and the model and the experience was later used overseas. 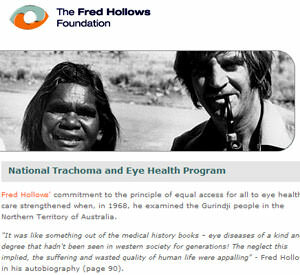 The task force approach was the National Trachoma and Eye Program, led by Professor Fred Hollows. It was focused on blinding eye disease, but neither the conditions it encountered nor the instincts of Fred Hollows limited it only to looking at eyeballs. Every person the program saw was given a general health examination, and, in particular areas visited, the program made extensive additional studies of particular problems being encountered, including the incidence of sexually transmitted disease, respiratory disease, skin infections and infestations, middle ear conditions, and diabetes. The program was the genius of Gordon Briscoe, now Australia's most senior Aboriginal historian, who had earlier played a key role both in establishing the Redfern Aboriginal Medical Service and in recruiting the wild and irascible Fred Hollows to be its foundation medical director. Its establishment was also funded by a challenge that a bright doctor-come-politician, Peter Baume, threw at the various Australian medical specialist colleges – that, if they really were about the public interest rather than their self-interest, they ought to prove it by getting involved in improving Aboriginal health. The College of Ophthalmologists took up the challenge, and not only with a tight salaried task force, but with the additional and unpaid assistance of hundreds of ophthalmologists who volunteered. Many of these are still involved in providing ongoing services to Aboriginal communities. The program cost the Commonwealth about $4 million in 1979 dollars. At various stages, when, for one reason or another funding was in the balance, government was given to understand that, if needs be, the program could carry on by bulk-billing the Commonwealth a GP fee for each examination, and a specialist fee for each specialist examination, as well as surgical fees for all procedures. Had we operated on that basis, the cost to the Commonwealth would have been at least $8 million. My wife and I worked several years with the program. I first became involved, as a reporter, during funding negotiations in 1975, and, once the program began operating spent a month reporting (and pitching in) with task force teams the next year, inter alia recording Fred Hollows' memorable phrase that 'if the health services around here were organised for animals rather than Aborigines, the RSPCA would prosecute''. I was so bowled away by the disaster of Aboriginal health that I obtained a two-year leave of absence from the Canberra Times and went to work with an Aboriginal medical service in Central Australia, helping to set up new services. Then I went to work directly for Fred as an organiser, dogsbody and report writer. My wife, Susan, whom I met on the program, organised surgery programs in the wake of the main teams' progress, and mass treatment programs. Trachoma is still around, but neither with the intensity and severity of old: in 1976 virtually every Aboriginal child in three quarters of geographical Australia had the infectious, conjunctivitis, stage of the disease, and about one in four old people (people aged 60 or more) were blind from trachoma, corneal eye disease or cataract. There is still too much Aboriginal blindness, but the likelihood of old-aged blindness among the middle-aged remote Aborigines of today (who were kids or young adults then) will be but a fraction of what it once was. As now, the root of trachoma, and almost all the other illness we saw, was living conditions. Poor and over-crowded housing, if it could be called housing at all, inadequate water supplies, an inability to separate garbage and sewerage from the living environment, and poor diet. Inadequate or non-existent medical services made virtually every Aboriginal the host of what Dr Peter Moodie called 'a wardful of diseases in each body''. Treatment helped, but exposure did not create resistance, and those 'cured' were quickly sick again. There were times when, in describing what we saw, we used phrases such as 'national disaster' and compared the national mobilisation to help the 1974 Darwin cyclone victims with the resources going into Aboriginal affairs. We made use of the army too, and had high praise for its style of operation. But the army's help, and what was needed, had very little in common with the impatient 'boots on the ground' approach and coercive methods which seem to be favoured by Mal Brough, the former soldier turned instant expert on Aboriginal affairs. Indeed it was as much the failure of Brough-style authoritarianism as the lack of investment which had created the mess with which we were dealing. What made us different? We consulted, liaised, talked, reported back, and, so far as we could, we delivered too. Even in 1976 we found Aborigines weary of 'yet another survey' and 'yet another lot coming through, making promises, never to be seen again'. The program employed Aboriginal liaison officers who went into communities, long before the teams arrived, to explain what we were doing and why, and to negotiate assistance. Local liaison officers were appointed to help organise the actual visits. We did not wait for people to come to clinics, but went out and looked for them in the camps. In one community, which had been the subject of regular visits by an eye doctor, (of his own initiative, free, but based on people presented by a clinic sister) the doctor told us that, because of his regular visits, there were no blind people here. We saw 30, from the camps, in one afternoon. Some of the meetings we initiated metamorphisised into standing groups, not least the Pitjantjatjarra Council, which was first convened, from Pitjantjatjarra groups in South Australia, Western Australia and the Northern Territory, in response to our request to discuss what people could do about our findings. We worked hard, in short, to make the people partners in our program, and to give individuals, families and groups a strong sense of ownership. Most of the time, of course, we were heavily self-critical, thinking that we could have, or should have, done it better, but that we were doing it better than it had been done before we were always pretty confident. I wish I could be as confident about the task forces starting out – first with cops, then with army officers, then some doctors not yet consulted or organised, with alienated state infrastructure and no sense of engagement with the service providers on the ground, let alone the objects of the attention. Complete with abuse by the minister of the people whose cooperation he needs, and the general implication that anyone who stands in his way, or doubts his good intentions, is an apologist for child molesters. Jack Waterford has been an editor of the Canberra Times since 1995. He contributes to Eureka Street regularly.